The Salmon of Capistrano useless website. You can move the salmon with the mouse. The background music is an instrumental version of the song Waterfalls by TLC. 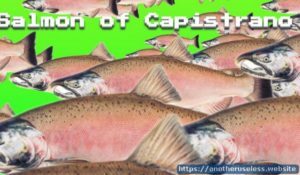 What is the salmon of Capistrano? Are you wondering what does salmon of Capistrano mean? Well the salmon is a large edible fish valued for its pink flesh. Salmon hatch in fresh water, migrate to the ocean, then return to fresh water to spawn. Capistrano, San Juan Capistrano, is a city in in Orange County, California. The city is famous for its cliff swallows, social song birds that can be found in large nesting colonies. On March 19, the swallows return during migration. What is the connection? How did this started? This seems to be an intentional comic mix-up because the swallows are known for flocking to Capistrano every year. Because Lloyd is dumb…he confused the swallow with the salmon. A salmon can’t “flock” in the literal sense because it’s a fish not a bird. Salmon do however return in large groups periodically to spawn. So it could be a hint that the women in Aspen act in an analogous way.